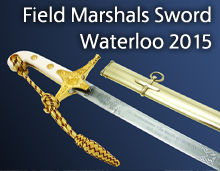 When the 1822 pattern Infantry sword was introduced, the Rifle regiments were ordered to adopt it. 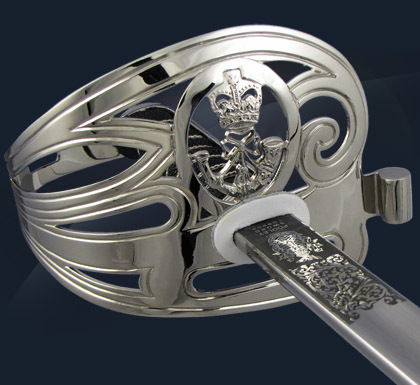 In 1827 however, for The Rifles, the gilt brass hilt was replaced with a hilt of the same design made in steel. The Royal Cypher was also replaced with a stringed bugle horn. Today, the Gurkha officers carry the Rifle pattern sword with a plain oval surround to the cartouche on the hilt, showing the stringed bugle horn, as carried by Officers of The Rifles. British Army regiments have always been proudly individualistic-none more so than the rifle regiments. Thus in 1822, when their officers were required to carry the same sword as “ordinary” regiments of the line, the ruling met with widespread disfavour. 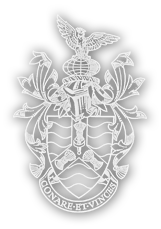 So much so that barely five years later, new orders were issued officially authorizing the rifle regiments to adopt their own variant pattern in which the royal cypher on the hilt is replaced by a crown and stringed bugle.